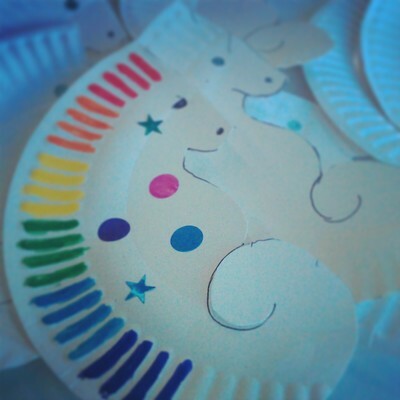 A decorative activity for young children to do, making a seahorse out of a paper plate. 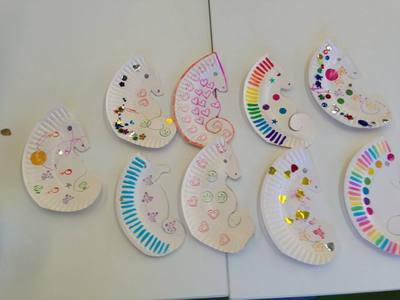 The indents on the edge of the paper plate make an effective seahorse dorsal fin shape which can be decorated with colour pens, crayons, glitter or stickers. Level: Medium (requires adult to hand draw seahorse shape) Easy for child to decorate. The hardest part is hand drawing the shape of a seahorse onto the plate, with the back fin using the plate edge. This will require an adult's skills, and may require a few attempts before getting right! Use scissors to cut out seahorse. Child decorates with embellishments, glitter, colour etc.